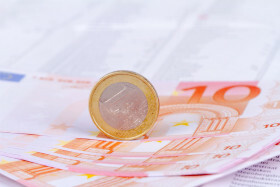 The euro today dropped significantly against the US dollar from the early European session after attempting to rally higher during the Asian session. The single currency’s decline was initially triggered by the US dollar’s rebound before the weak German GDP data caused it to crash to new weekly lows. The EUR/USD currency pair today dropped from a high of 1.1490 to a low of 1.1385 following Draghi’s speech. The currency pair’s initial decline was triggered by the stronger greenback before the release of the provisional German GDP growth data for 2018. According to Germany’s Federal Statistical Office, the country’s economy grew by 1.5% in 2018, which was much lower than the 2.2% recorded in 2017. The slowdown in economic growth within the EU’s largest economy triggered a selloff in the single currency as investors digested the news. The currency pair headed lower in the American session following dovish comments by the European Central Bank President during his annual speech at Strasbourg. According to Mario Draghi, recent economic releases have been quite weak, which has occasioned the need for further stimulus measures. The release of weak New York Empire State Manufacturing Index in the early American session had a muted impact on the currency pair. The release of the mixed US producer price index data by the Bureau of Labor Statistics also had minimal impact on the pair. The currency pair’s future performance is likely to be affected by tomorrow’s harmonized German consumer price index data for December. The EUR/USD currency pair was trading at 1.1397 as at 17:05 GMT having crashed from a high of 1.1490. The EUR/JPY currency pair was trading at 123.85 having fallen from a high of 124.85.